Serve your customers a taste of the shore, delivering rich seafood flavor in a creamy and satisfying soup. Combining fresh, tender sea clams, and sea clam juice, garden-ripe tomatoes, carrots, sweet peppers, celery, onions, and seasoned with spices, this Chincoteague condensed Manhattan clam chowder features a wholesome medley of full-bodied flavor that's sure to please. Since 1955, Chicoteague's family owned business has featured canned options for top quality seafood and fresh ingredients with gourmet flavor. 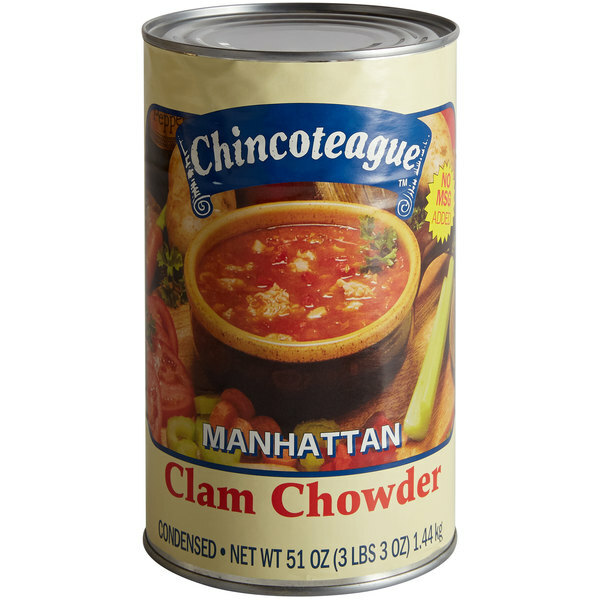 Offering a homemade taste, Chincoteague soups have no preservatives, artificial colors or flavors! This soup is easy to prepare, lessening prep time and strengthening good service, and its hearty consistency makes it a welcome addition to your menu. The savory and velvety taste of Manhattan clam chowder makes for a flavorful entree or appetizer. Serve with salty crackers, pair with fresh seafood offerings, or use in other gourmet creations! Empty contents into a saucepan. Add an equal amount of water to each can. Heat slowly, stirring often until evenly blended. DO NOT BOIL. 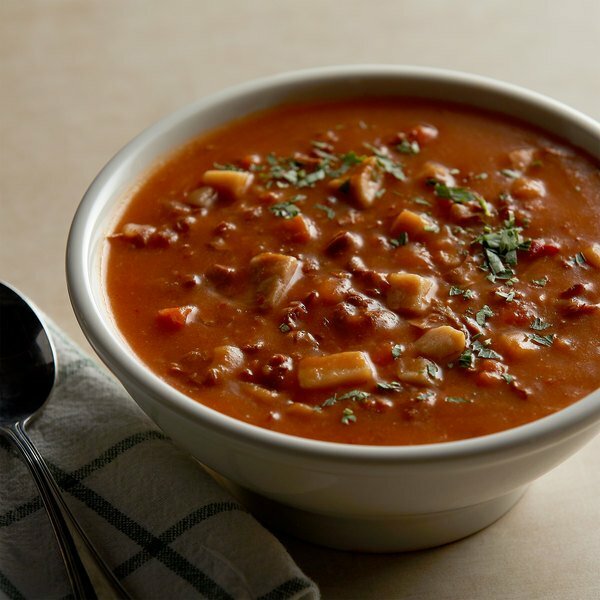 The Manhattan clam chowder is great and full of flavor and has a great taste. The chowder is terrific for serving with our garlic biscuits. The condensed Manhattan calm chowder is terrific and very fresh tasting. A great consistency and no funky smell like with other brands. The chowder is a nice addition to our soup bar. Our favorite style of clam chowder that is delicious and has a top notch creamy consistency. The chowder makes great starters and appetizers for our meals. The condensed Manhattan clam chowder is super good. The chowder heats up really well and is very creamy. A great quality soup that is easy to prepare. A wonderful version of Manhattan clam chowder that is sure to be a crowd pleaser. The flavor is rich and creamy. It cooks up quick and easy. This was my first time ordering this condensed Manhattan Clam Chowder and I will order it again. The fifty one ounce can was perfect in size for our batches but the flavor is what has most impressed me. The tomato, clam and sweet pepper combo is delicious and we have received numerous questions pertaining to the amount of time this soup takes to make. Clam chowder is a very popular soup and especially on a cold wintry day. It is a soup often found in grocery markets but many not as good as this version of it. Bought as an alternative to the cream based ones, this came out with the same quality expected from the brand. Easy to prepare, and not too much for the home use we put it through. This manhattan clam chowder is good. Make sure you season it for your taste. I also recommend you serving with crackers. Customers enjoy this soup. I love clam chowder! This soup didn't even really taste canned but homemade! The shipping was really fast too which was a good thing because I didn't have to wait very long.